Self-driving cars? Fraud detection? Both examples of machine learning in use-and examples of why programmers can't wait to dive into the growing, innovative field. Get the Complete Machine Learning Bundle for $39.99 at Escapist Deals. You'll get 10 courses packed with training in all of the different ways you can apply machine learning. You'll get training in must-know machine learning principles like decision trees, ensemble learning, random forests and more. Plus, learn how Python and machine learning work together and master effective machine learning techniques. You'll also discover how machine learning powers product and ad recommendation systems, get practice scraping websites like the New York Times, and plenty more. Best of all, you'll get lifetime access to every course in the bundle, giving you plenty of time to master the material. Save 94% off the regular price of $780. 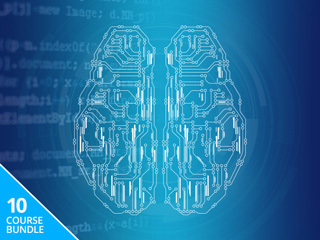 Get the Complete Machine Learning Bundle for $39.99 at Escapist Deals.